Got Foggy Windows With Failed Seals? Do your windows have condensation, dust or moisture between the double panes of glass? Do the seals at the edge of the glass snake and bend away from the edge of the window? If the answer is yes, it’s likely the window seals have failed, breaking the hermetic seal between the dual panes of glass. The air tight seal and gap between the two panes of glass create an insulated barrier between outside and inside of the home or commercial building. If you are thinking of replacing windows that have failed seals or are selling a home and need to fix foggy windows prior to sale, now is a great time to have foggy windows repaired. Call SR Windows & Glass to get huge savings in November 2018! How Do Windows Get Foggy? 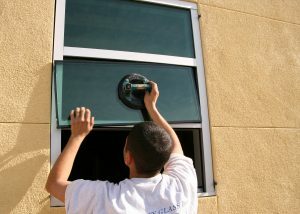 It is a well established fact that dual windows glass panes substantially reduce heat transmission through the glass areas as well as in allowing significantly higher relative humidity during the winter than possible with single glass pane windows sans excessive condensation on the inside glass surfaces. Condensation occurs on the inside surface of the outer glass pane whenever its temperature falls below the dew point temperature of the air space. This moisture between double pane windows typically results in foggy windows. Condensation in windows can be quite irritating, as they can damage your home as well, particularly if you have older windows. It can damage plaster and cause formation of mold in the wooden frame, damaging it permanently. On the one hand, excessive moisture inside your home that leads to interior condensation, apart from damaging the areas around your windows, can cause damage your entire abode as well. Therefore, you should address this problem soonest possible to prevent further damage to your home. On the other hand, exterior condensation on your window is only dew and takes place when the window pane is colder compared to the dew point. Is It Possible To Repair Foggy Windows? Dual pane glass windows are manufactured by sealing air inside dual layers of glass. Over time, contraction and expansion causes this seal to weaken and ultimately fail, allowing the formation of water vapor inside them. This vapor creates a foggy appearance when it condenses on the cold glass. However, this does not imply that homeowners need to replace the window in order to eliminate this fogginess. They can either remove the moisture by drilling into the window or remove the glass and substitute it with a new factory sealed unit. The former option costs less and only restores the clarity, whereas the latter method restores the original insulating value of the window. Dual pane windows consist of two panes of glass separated by a spacer. The spacer and the glass are sealed together to form a moisture and air tight unit. The sealed air between the two glass panes provides insulation to the windows as moisture cannot penetrate and rob heat and the sealed air cannot move or create convection currents. In case of broken window seals, or due to window seal failure, moisture gets inside the space, forming condensation, resulting in fogged glass. This also occurs upon saturation of the desiccant (a porous and crystalline substance that is used to absorb moisture from inside the sealed air space of the insulating glass unit) inside the windows. The window seal failure, apart from allowing formation of moisture between the two glass panes, also allow dirt to enter between the panes, resulting in fogged windows. Do it yourself enthusiasts can remove the moisture and the stains by drilling tiny holes in the glass (ensure to cover the glass with cellulose tape to prevent it from shattering), removing the moisture and the dirt stains, and finally sealing the holes with clear plastic vents. However, this is not a viable option in case the seal breaks. This too causes fogging along with other types of distortion of the glass, making it difficult to view through the windows. In such a scenario the sole option is replacing the glass units. Professional glaziers can perform window replacement without removing the entire window frame. A glass contractor will measure the glass units, remove them, and replace them with new ones. Dual pane insulated glass windows, apart from preventing heat from outside from entering your home or office, also reduces your energy bills, as it prevents the chilled air inside the room from going outside through conduction. It also plays a major role in preventing noise from outside from entering your office or abode. However, you lose all these advantages in case of broken window seals. If your dual pane glass is damaged beyond repair, it is time to replace it with a new one. Instead of taking a risk and damaging your window frame by attempting the job on your own, it is better to seek the help of a professional for your foggy window repair issue. Hire a professional glass contractor or glazier for your dual pane window glass replacement needs. Their specialist will provide a new and suitable dual pane window glass unit and perform the installation as well.